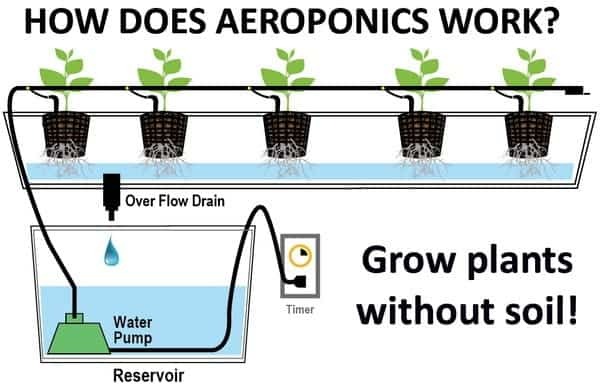 This well-researched article will show you how to build your own Aeroponics System and also give you an introduction to aeroponics system of farming. Aeroponics is the process whereby plants are grown in an airy or misty environment without making use of soil or any other aggregate medium, also known as Geoponics. The word is derived from aero-, and ponos, which are Greek words meaning air’ and work’. In aeroponics, the water is used to transmit nutrients. Thus it is considered even as a type of the hydroponics farming. As every other gardening system, this one also has its benefits and drawbacks. The biggest and most obvious benefit of the aeroponics system is that crops are easiest to harvest in the absence of soil, thus it also reduces labor cost and risk of disease due to pest infestation. The roots problem, which appears quite often as a gardening problem – is not as big of an issue anymore. Now with aeroponic systems, roots are provided with better exposure to oxygen, and there is no need to immerse them in water. That offers us much more control. Disadvantages are dependence on the system, so if anything breaks down, your plants can be damaged or killed easily. Another thing which can stop you from using this soil-free gardening system is the lack of technical knowledge. You need a certain level of competency in running an aeroponic system. Nonetheless, by carefully following simple instructions provided here, you can make your own quite easily. Some of the tools mentioned can be bought at the nearest gardening markets. You can, also, always opt out for online shopping. Amazon provides you with everything you need. We are going to set up a homemade aeroponics system. The time you’ll need for making this is about 30 minutes for a single plant and will cost you about $30. The garden hose needs to be cut into two pieces. One piece is for the filter, and one for “circle” dripper. You will need to drill the small holes in the bottom of the pot, and one large hole for the hose. Put the garden hose used for the pump into the large hole. The second piece of the garden hose will be used to connect both ends to the “T” fitting. Use any type of rubber tube in a place of the hose. Drill cca. 30 smaller holes into the “circle” hose. It should let water to drip down. No need to drill the holes too big, as the water will need to dispense all around the circle. Drill one hole in the bottom planter, so pump cord can come out if you desire. Now, you need to connect one end of the hose to the pump outlet and fill the bottom planter with water. Set pump inside. After dropping into the flower pot and feeding the hose up and through, connect it to the “circle” water dripper. The pump should be at the bottom of the large planter. It needs to have water in the bottom. Fill the flower pot with the hydro balls you have. Then place your seedling down in the hydro balls. When you finish everything, you can turn the pump on. See the water dripping from the hose. Let the water drip, and watch your plants grow. Plug the pump for aquarium into an outlet time. Set as you think is needed. Note: daily check the level of water inside the bottom planter, and refill if needed. In 2 of the buckets, drill a three-quarter” hole, two inches from the base and In the final bucket, drill a 3/4″ hole, one inch from the base (ideally, this would be your reservoir bucket). Proceed to insert rubber-grommets inside each of the three buckets. Take the five-foot piece of three-quarter” plastic hose and cut it in half. Insert a three-quarter” connector to 1 end of each piece of the hose. Connect both pieces of hose with the “T” connector. Insert “T” connector into grommet of reservoir bucket. Now that you have grommets and connectors on your hose and buckets, connect the other two buckets to the main reservoir. Your main reservoir will now be centralized in your system. Fill a separate 5-gallon bucket with water and test pH levels using a pH tester kit. You may need to use your pH up or pH down to adjust your levels accordingly. Once pH levels are optimal, you can dump your water into the buckets. The water level should equalize quickly. With the 5′ length of plastic-tubing, attach one end to the submersible water-pump, and then attach end-cap to the remaining end. With the one-quarter” hole puncher tool, make a hole on each side of the tubing about halfway down the length and insert 1/4″ connectors. Cut the 4′ spaghetti tubing in half, fit each piece to one of the1/4″ connectors. To the open end of spaghetti, tubing attaches a pressure compensating dripper. Insert the substrate baskets into the 2 outer buckets and then fill about halfway with the clay pellets. Submerge your Rockwool cube into basket center and fill the basket up to the top of the cube with more pellets. Cut the 12′ of air-tubing into equal dimensions. The total number of required lengths will vary depending on the available number of air outlets on your pump. Attach each piece of tube to the pump, and to the open ends of your tubes attach air stones. Put ends of air tubes with air stones into the reservoir-bucket. DO NOT PUT PUMP INTO BUCKET. Place next to the reservoir and plugin. watch the bubbles and have an iced tea. Put the submersible water-pump inside the reservoir-bucket. Be sure to position your tubing between the 2 planter buckets and then stake the spaghetti hoses as well as drippers into the Rockwool. Ensure that before turning on your water pump, make sure it is completely submerged in water. If you need to add more water, make sure you adjust the pH before adding it to your reservoir. Now plug in your water pump and watch your garden grow. That is it, after trial and error with the right materials, you should be able to have your System up and running. Let’s know about your experience in the comments.